Under the Microscope this month is Josiah Menako, MDG’s Wastewater Technical Service Specialist. Josiah plays a key role on our wastewater treatment team by specializing in servicing and educating our distribution partners for success! 1. What drew you to Microbial Discovery Group (MDG)? While in school, I was working in several research labs and I strongly desired to continue that professionally. In my mind it is the coolest job. I’ve been a scientist at heart since I was a kid. The story of how I specifically got to MDG is pretty unique. I worked at Panera all though high school and a bit during college. A few times a week, I would take the order and make the food for Mike King, his wife Sharron, and their two daughters. Little did I know, Mike was writing the business plan for MDG while he was there. As I got to talking with him more and more, I mentioned that I was going to school for Microbiology and he told me to give him a call someday. One year before graduating, I decided it was time to give him a call and the next thing I knew, I was an intern doing what I loved. My position is unique in that my time is split between the office and being out in the field. Training companies/customers on MDG, microbiology, and our products. The goal of these trainings is to make them confident and competent in MDG and our products, so they can go out and solve challenges for their customers. Taking sales calls. Often, I’ll be with a distribution partner as they go on sales calls ranging from first meetings to the closing of a sale. These can be really fun! The goal is to get our partners comfortable with doing it themselves and many do so very quickly. Surveying facilities. Ideally, when a distribution partner and I make a visit to a new opportunity, we want to go survey specific parts of the wastewater treatment system (ex: lift stations, sludge tanks, lagoons, and collection systems) because we have specific treatment programs that target the common challenges in those locations. Once a sale is closed, I’ll occasionally be there for the actual treatment (adding our Bacillus to a system) and aid in the collection of baseline data. This can range from setting up a pump and bucket to dose our liquid products into a remote lift station in the basement of a cheese factory, to adding hundreds of Kg’s of our 40B product into 100 million-gallon lagoons. It’s never the same! Lastly, we always want to collect data to see what kind of effect we have overtime. From there we can calculate how much money we’ve saved the end user. So far, I’ve been to ten states and two other countries in my technical service travels. I frequently create content for newsletters, write treatment & service reports, case studies, and all kinds of supporting documents, training material, and power points. Training our sales team and our customer’s sales team to make them more confident and competent. Talking on the phone with customers about possible opportunities and helping them pursue good opportunities and walk away from the not so good. Right now, I’m preparing for a week-long trip to support one of our distribution partners. Each day we have highly qualified facility visits and meetings set up to go out and identify how we can help. My favorite part by far is getting to travel and see the world, while also having new experiences meeting some very inspirational people. I really enjoy being able to promote something I believe in and see the direct impact we have out in the field. I feel very connected to MDG and enjoy the ability to have relationships with people at all levels throughout the company. I do competitive sailing Friday nights out from the Milwaukee harbor with occasional long-distance multi day trips. In general, I just like to be as active as I can. Dominic and Firmin (MDG coworkers and friends) have gotten me addicted to Futbol in the last few years. I also enjoy tennis, volleyball, basketball, and just being in nature. To become a wastewater Jedi! 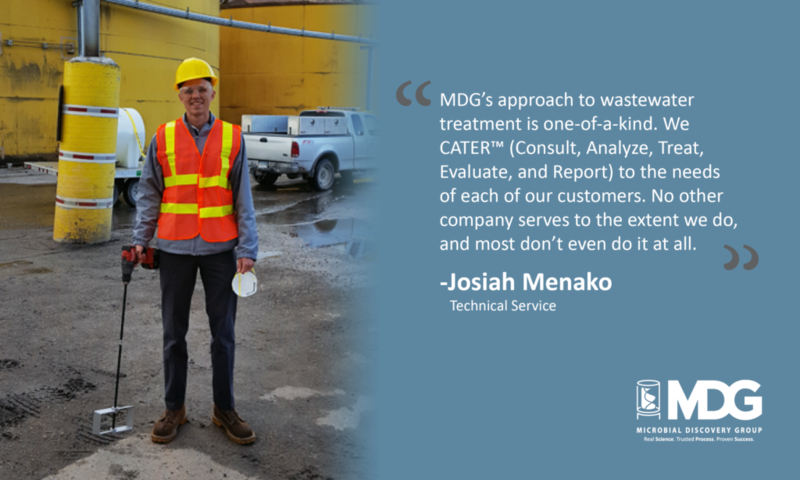 MDG’s approach to wastewater treatment is one-of-a-kind. We CATER™ (Consult, Analyze, Treat, Evaluate, and Report) to the needs of each of our customers. This approach entails a comprehensive plan beginning with educating our distribution partners though classroom and in-field training. We then assist with the surveying of wastewater opportunities and support our distribution partners in the creation of proposals, outlining how we will help and monitor success. Once treatment is complete, we collaborate with our partners in the creation of a final report. These reports document success and often turn into well-polished case studies that can be used as future sales tools for our customers.